Did anyone else find this puzzle really difficult? I got a chunk of stuff across the middle really easily, knew all three right hand columns down to at worst two possibilities each (like the 1- in the upper right is 4-3 in some order), and the same along the bottom. But then I totally stalled and had to guess and check for like half an hour to get it. Was this really a medium puzzle? What was I missing? Edit: I wonder if this one had more subtractions than usual, especially in the top three rows, and if that contributed to the difficulty. My trial and error key came in determining whether 5 went int the 1st square of row 8 or in the 8+ cell next to it. There were only 103 solvers 2 weeks ago because it was a subscriber only puzzle. Last edited by sjs34 on Thu Sep 06, 2018 1:40 pm, edited 1 time in total. I also found it quite tricky. I abandoned it last night and started again from scratch this morning, but it took me nearly 20 minutes to solve and a certain amount of trial and error. I think the difficulty level is reflected by the relatively low number of people who have solved this puzzle - I think I was the 125th. I went back over the last month of Thursday medium 8x8s and the number of solvers was typically around 500, although the one from two weeks ago only had 107 solvers. I tried it again - there's a little help on the top row. There was a 9+ and a 0-, so those add up to some odd number. That means the sum of the three numbers on the right are the top row. So those have to be 3 odd numbers or one odd and two even, and some of those use up the numbers that would have to go in the 0-. That at least narrowed down the guessing I had to do. Yep, it didn't feel like a medium puzzle at all. Below is the puzzle for reference. It does seem more difficult than usual for a medium puzzle. I did as much as I could without doing anything in the top left part of the puzzle, then I added the cages in rows 5,6 and 7, this meant cell a6 can be solved and then the rest of the puzzle is straight forward. In my opinion that's exactly what happens. For instance, we know that in a KS the difficulty level increases if the size of the cages increase, that is, if you have cages with a big number of cells (though being additions, the number of possibilities increase). The subtraction cages operate in a similar way in a Calcudoku. The number of possibilities, in both types of puzzle, is proportional to the difficulty, since they require more analysis and more time to solve the puzzle. So a quick look to the puzzle gives you an initial idea of the difficulty. The subtraction cages have a bigger number of possibilities (combinations), depending on the "measure" of the cage, and inversely to this "measure", i.e., a 2-cell "5-" cage (let's call it of "measure" 5), in an 8x8, has three possible combinations: [1,6], [2,7] and [3,8], while a 2-cell "1-" cage, in the same puzzle, has seven possible combinations: [1,2], [2,3], [3,4], [4,5], [5,6], [6,7] and [7,8], being, for a 2-cell cage, the number of possibilities equal to the "distance" between the size of the puzzle and the "measure" of the cage (8 - 5 = 3 in the first case and 8 - 1 = 7 in the second case). A 3 cell L-shape "0-" cage, in an 8x8 (fm 1 to 8) has sixteen possible combinations: [1,1,2], [2,2,4], [3,3,6], [4,4,8], [1,2,3], [1,3,4], [1,4,5], [1,5,6], [1,6,7], [1,7,8], [2,3,5], [2,4,6 ], [2,5,7], [2,6,8], [3,4,7] and [3,5,8] (BTW, a 3-cell L-shape "1-" cage, in the same puzzle, would have twelve possible combinations). A multiplication cage has in general fewer possibilities, i.e., a 3-cell L-shape "72x" cage, in the same puzzle, has only three possible combinations: [3,3,8], [3,4,6] and [2,6,6]. In the puzzle we are considering we have a total of 11 subtraction cages, mainly concentrated in the 5 leftmost columns, and three of them are 3 cell L-shape "0-" cages. Additionally, the 3-cell in-line "0-" cage in the upper row has "initially" twelve possible combinations. While it is true that the size of the cages and the type of operator can indicate how difficult a puzzle is, this can be negated by the number of possible combinations being reduced as the puzzle solution progresses. 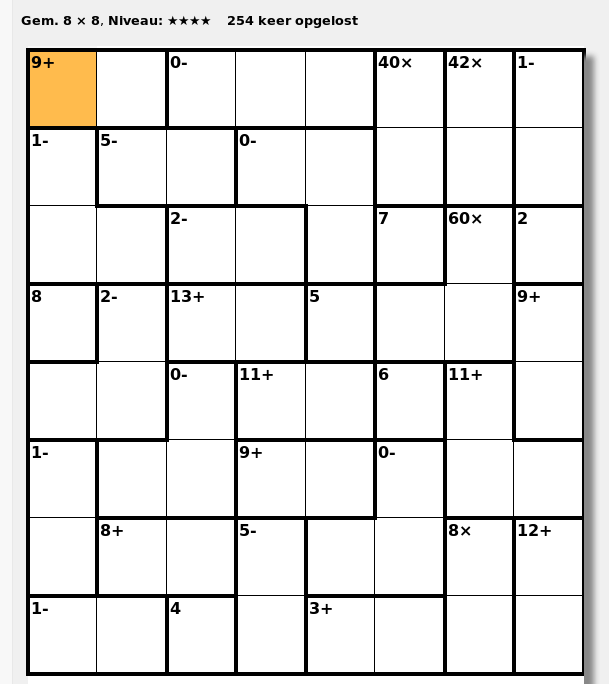 In this puzzle I did not give any thought to the two 0- cages in the top 3 rows until there was enough of the puzzle solved that the answer for each cell was clear. so puzzles like these won't appear again?